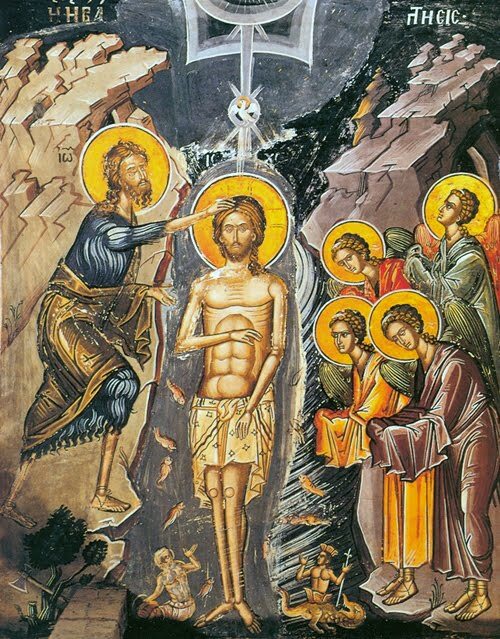 The first day of the Forefeast of Theophany falls on January 2. Like the hymns before the Nativity, many of the Church's hymns of this period are slightly modified versions of the hymns of Holy Week. One of the hymns at Matins today says that the coming Feast of Theophany will be "even more radiant" than the Feast of the Nativity. From the Church hymns for this day: “With pure lips and souls undefiled”, “let us sing hymns of the Forefeast, let us piously proclaim the honorable baptism of our God: for he wills to approach His Forerunner in the flesh. As a man He asks for the baptism of salvation for the regeneration of all", "for the renewal of souls". "Christ is made manifest. God is revealed", "Who knows no sins at all, as one guilty", "for the servant comes asking for baptism": "let the faithful hymn Your extreme humility". "Let us come with Christ to the Jordan", "let us flee from every impure passion", "come thoughtfully with purifying streams of tears to the worthy baptism of the divine image", "that the light being specially revealed, cleansing all with divine rays, O Master, we are revealed everything.” "Look upon Christ who voluntarily humbled Himself. He even took the form of a servant. Let us humble ourselves beneath His mighty hand, Who was adopted by the Spirit: that we may honor His baptism with pure deeds”.